Data segmentation is the process of partitioning data into segments based on common attributes and meaningful correlation for better usability. Real-time data-driven segmentation and real-time hierarchical data segmentation involves clustering or grouping data that could be customer data or any business data or statistics. Real-time hierarchical data segmentation is a type of data segmentation that is based on coming up with subsequent groups based on previous ones. Real-time hierarchical data segmentation can be done from top to bottom or from bottom to top. Through real-time data-driven segmentation business enterprises at times segment their most lucrative customers to target them for a particular marketing offer or customer service. This helps in providing them with the most appropriate marketing offers as well as customer service. Real-time data-driven segmentation and real-time hierarchical data segmentation help organizations increase productivity and profitability at customer levels. They provide them the ability to get a complete view of customers from customer data. Real-time data-driven segmentation enables well-organized access to customer information that helps in database marketing. Understand Customers’ Needs: Real-time data-driven segmentation helps businesses reveal various traits that describe customer behaviors. They enable companies to automatically examine and gather required data from multiple databases, rapidly providing them with customer information that can aid in making decision regarding customer support. Propose Targeted Deals: Real-time data-driven segmentation determines targeted customer tendencies enabling businesses to make more likable decisions about product marketing and campaigns. Improve Customer Value: Real-time data-driven segmentation enables business marketers to focus on targeted customers to enhance customer value and loyalty. Single Click Solutions Business Analysis Solution offer DEXPRO (Data Extraction and Processing) software that facilitates users to combine data from multiple sources and provides services for data extraction, export, report creation, mail merge and email broadcast. 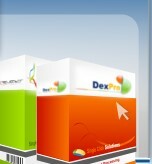 Read more about the features of DEXPRO.